Doctors Day & My Doctor. We will be very healthy, but who know what will happen to us next minute, suddenly we feel sick, or affected by any disease in this pollution world. So that time, we need a person to solve our problem, he is Doctor. What every happen to us, first we visit doctors and then only god. Can we imagine a world with out Doctors? In the Medical world, doctors have discovered many medicines to cure rare disease and working day and night for us. And now its time to thanks them for their great work in this World. After mothers and fathers, it is the turn of doctors to celebrate their Day on July 1. Doctors Day offered an opportunity to express gratitude to doctors for the selfless service to mankind, it said. Doctors Day came into being in 1991 when the Government of India recognized July 1, the birth as well as death anniversary of Dr Bidhan Chandra Roy. Its time to remember about My Family Doctor R.Nandhakumar. From my memory day, I am getting treatment form him. Whatever problem I get in my health, I will visit his clinic and get cure. My brother & I have scolded him many times for pinching injection, instead of getting angry he will smile. Even if, we call him in the mid-night, he response us, and my dad and he was good friend, he was treating my grandma for at least 23 or 24 years. Some time I feel happy to visit his clinic to play with the things, which is on his table. Whenever I go I try to secretly steal the scenery photos form his table, if we use the medicines by his advice, sure it will work out well. He was one of the Best Doctors in Chennai; He was a neurosurgeon in Chennai Government General Hospital, and Professor in Chennai Medical Collage. 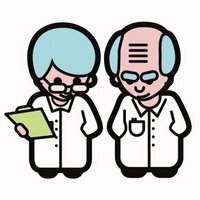 Nowadays I can’t visit his clinic to play with his table, he is intensity to find medicine for my dieses, he also introduce us to some MD specialist for treatment, every doctors are in research to fine medicines for my dieses, hope they will achieve it. Thanks Doctors, for your hard works to keep us healthy. The person with Sticking cheek, long teeth's, and swinging tuft, the Brazil player Ronaldinho is the No.1 Football player in the world now. Yes I am Ugly, but u have to accept that I have a weed, said Ronaldinho. It’s true, he not only have weed, and also have a Football art. If he comes by screen trellis the ball, the opposite teams are tremors. Many remember his striking goal against England In last world cup form a distance of 100 feet, the ball crossed 5 players. Ronaldinho’s full name is Ronaldo de Assis Moreira. Already there is a Ronaldo living in a great prosperity in the team, so they added ‘dino’ as his last name to distinguishing. In Brazil language dino means little, so he is little Ronaldo. Name definition is enough, let see in which way he got this name. Ronaldinho was born in a poor family on March 21st, 1980. His father was doing welding work. From his childhood, football is the best ancillary for him, not only for him, the football is the best ancillary for most of the children’s in Brazil. Not only that, his elder brother was a talented football player. Ronaldinho got interest in football, by seeing his elder brothers play. When he was 8 year old, his father died in heart attack, family responsibility was fall on his elder brother. He earn money by playing football for clubs, in this time another sorrow, his brother was wounded when playing, and he was in a situation of cant play again. When Ronaldinho was 13, he participated in a local contest and strikes 23 goals in a single match and cover everyone’s attention on him. It was a turning point in his life. He played in the Junior World Cup for Brazil and got the award and medal for outstanding player. After that he was in upward trend. Now Ronaldinho is 26 year old. He was the player, to earn more in the football world. Barcelona club (where he plays) was paying him 45 crore (450 million) as salary. Except this you know what was his annual income form advertisements in a year? Its 90 crore (900 million). I am thinking about ------ How to face my future, and about our India’s development. 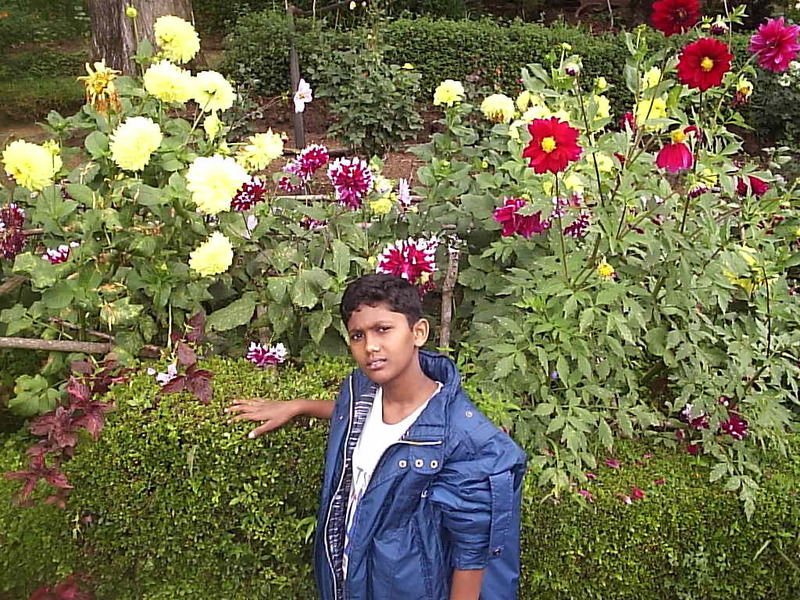 I want----------------------- my happiest days, which I send some years back. I dance--------------------- in dream (with trisha;), or in imagination. I sing----------------------- inside my mind & put some songs in CD and sing together. I make with my hands--- what ever I can do. I need----------------------- strength to fight to live. I start------------------------ counting every seconds, because I am time saver. Again it started to smoke in our friendly country Sri Lanka. Some sparkle incidents, which indicate for the war, have happen in Sri Lanka recently. A Garland blast killed 64 people, including 15 children’s in the Anurathapuram, the place were many Ceylon people live, this incident is the latest sparkle. Even though the Freedom Tigers (LTTE), refused there is no connection between this incident and them, next day, on the Tigers Camp including the places were Tamilan’s live were attacked by throwing booms form flights. On the Tigers side the life and material damages has increased. 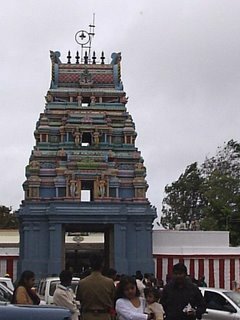 For some time the Tamilan’s living there has experienced some peace of mind, again uncertainty state of mind has grown. The number of people who come to Tamil Nadu as refugees has increased. By the Sri Lankan governments fixed time catch, seashore security has been tightened, even the gun bullets have launched on our fisherman’s. If a war situation grown on our neighbor country (Sri Lanka), Tamil Nadu should also have to experience its many back consequences. This was the proper time that the seashore of Tamil Nadu must have excess security. With the attempt of some countries like Norway, the war stop agreement that was in force at Sri Lanka, have been in expiring situation because of these recent events. 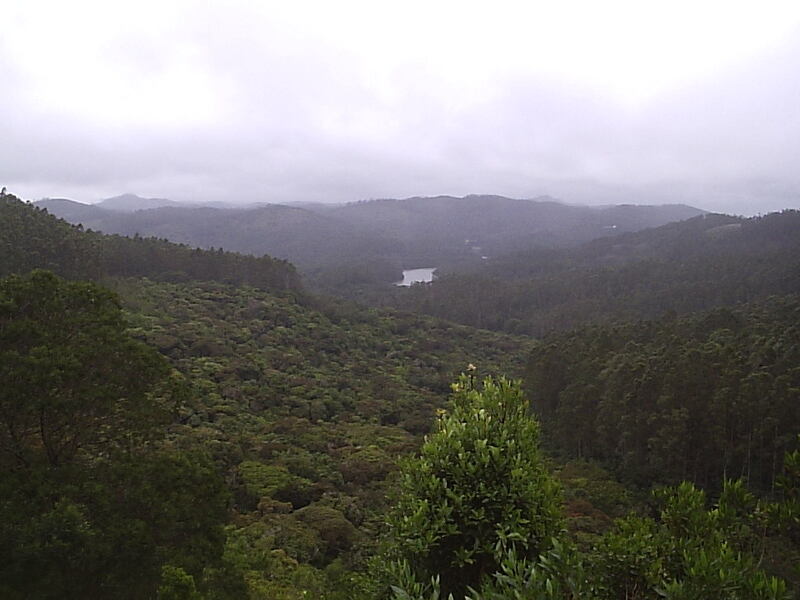 This distresses every one who wishes to see a peaceful Sri Lanka. Already the Sri Lanka has disintegrate, in the natural cruelty Tsunami, will they support another artificial tsunami in the name of war. Lets pray for the peace to return in our Friendly country. Today is World Music day, which takes place in France, Switzerland, Belgium, Luxembourg, Britain, China, Morocco and India on June 21, the summer solstice. It is spreading out, also taking place in many other countries across the world. I came to know about this day, form Radio Mirchi (FM), where they held a contest for audience to translate the Tamil song Poi solla poran (I am going to lie) to English (form Movie, Thiruttu Payale). So I decided to try, and wrote the full songs, pls excuse me if there is any fault in this. This song was shooted in the beautiful Australia. (Music) Nannan nanna nana, nannan nanna nana, nannana nanna nana na…. Nannan nanna nana, nannan nanna nana, nannana nanna nana na…. me, myself sink on it, in the small eye bell smiled smile. You are a single mango; I am a salt stone, why can’t we scratch and eat? ai ai ai..
Me only to get inside… yayeyaye, why can’t u give me some space? Idly, Pongal Sambar,Vadai. Eye bell you, till you show your eye, will wait with dignity. That’s it, very good boy. I am going to lie, I am going to lie, you are very beauty. I am going to lie, I am going to lie, I am little ugly. Yours tastes and my tastes, why can’t we make it one? We can do. Yours tastes and my tastes, why can’t we make it one? Let’s see. Distant distant happiness… yayeyaye why can’t we two give? Of course. We cross the Quarrel alias and why can’t we have relationship? Hai, its nice. I am going to lie, I am going to lie, I am little ugly. Only intend. Make the smallest small statue to smile, haha..
Wakening me from the sleeping, haha..
How do u come to know about Blog and got Friends? Really I don’t know what is blog and what’s its use. After I got Internet connection in my house, I used to browse only Yahoo.com and chennaionline.com and chat. So if I get any website address in Newspaper, I will check that site, like this one day I got some blog address in Hindu newspaper and in the same way I check that site and come to know that some persons have wrote about there personal thoughts and suggestion on some issues. In there blogs I saw a link called comments, I went there and saw many people have written their thoughts about the issue, when I try to comment their, it asked username and password so I leave it. After some days this blog comes to mind every time, so I decided to try it and got the register link form comments and created one. Even after started writing the blog, I don’t get any comment like others, so I forget to check the comment pages and continuously posting. One day accidentally when I check my previews post, I saw 1 comment; it was our Adengappa (Prabu) who have appreciated my writings. He was my first blog friend; through his blog I went to some blogs and started write comments. My first female blogger to read my blog is Vasanthi. 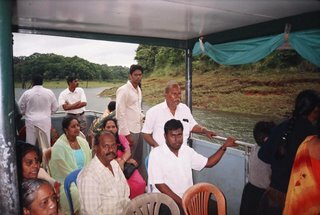 I got many friends only after Narayanan Venkitu link my blog in his blog and wrote about me, this what my blog travel started. First of all I don’t know this was blog, I thought it was a website and wrote some information’s, in other blogs they write about there life, memories and what are they doing everyday, so I tried to write about me and. Why you chose JeevansWorld as your blog name? After I come to know about Internet, I like to have an own site for me, to write the information’s, which I got, so this blog filled my wish. When I decided to give a name for the site, a idea struck my mind, it tell if you write information’s are form all over the world, your site name must be related to world and I thought if my site get many audience and become famous, we cant change the name so I add my name in that and wrote Jeevan’sWorld. Now this blog is my world, I can write any thing, what ever I think and what ever I read. Are u Happy after writing blogs? No I am not happy, I am very very happy. 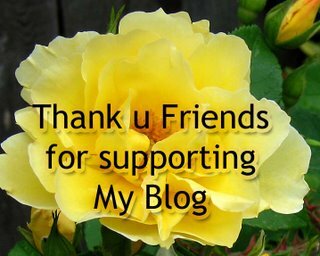 I dint imagine I will get many good friends; I should Thanks every Friend, who are reading my blog and appreciating me. This day, last year, I don’t know I will get many readers. This blog inspire me to think, what to post tomorrow, will readers like the post or not, many thoughts every day. I like the tags, which help other to know about us and we know about others (first persons to tag me is Jagan and Preethi). 2005 is unforgettable year for me; it’s an eye-opening year. Before 2005 my days are like watching TV, Computer games, hearing songs and watching the road form Balcony. In 2005 my mind turn on Readings (really don’t know how my mind turns on reading), I brought Newspapers and started reading, first it takes at least 1 and a half hours to read the headlines and first paragraphs on every news. Now it decreased to 45 minutes, for English newspaper, and half an hour for Tamil paper. Form February, I started to read Magazine The Week. If my mind dint turns on readings, sure I haven’t started this blog and got Friends to share. Friends not only stopped by reading my blog, they call through phone and met me in my house. Even my drawing skills have improved, in 2005. I was interested in drawing form my school days, after come out form the school, I have drawn many and only my parents will appreciate me, after the drawings will be one corner and some have lost. This blog brings my interest in drawing, after I post some of my drawings here and got encourage form you. It’s my luck to have you all here. What are u going to tell for your Friends on this Day? till now my love on you haven’t decreased, only increased. U never tried to hide anything form me, its shows your hope on me. It’s my duty to save your hope. 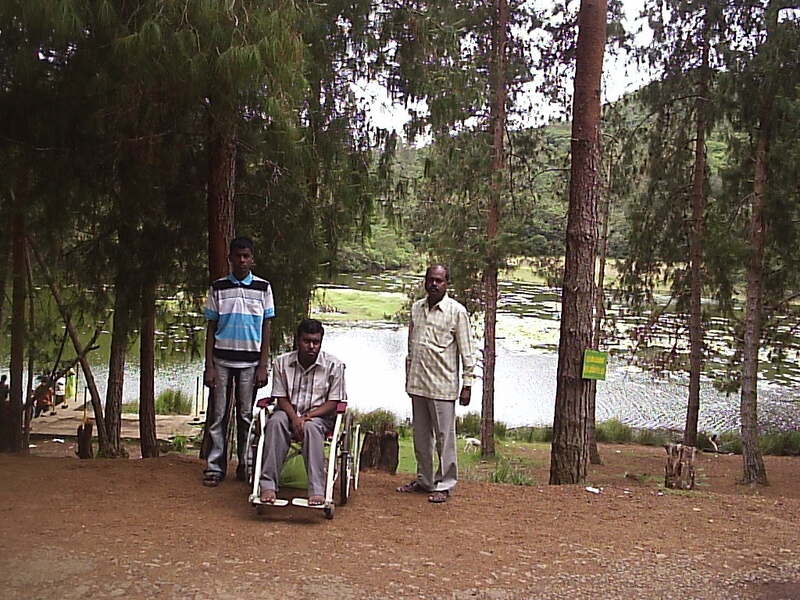 I enjoyed my Kodaikanal trip very happily, because of these helpful dears. I have to tell about them who are all have helped me in this trip. My dad, who was helping me form climb down and up from the car, lifting me to some places were the wheel chare can’t go, and stop the car in between while traveling and helped me on pass urine and took the foods form the hotel and give me in the car. Next my brother who lift me form the car to the room which is 10 steps form the ground, pushing the Wheel Chare, in some places my bro, the car driver and my uncle carry me with the WC. The Diver (his name was Raja) was very kind person, beating some jokes and makes us laugh. He drew the vehicle slowly in the curves to avoid me falling form the seat, he was a good company for me. And he become a good friend for me, he was an interesting person. He was telling me that he was working hard for day and night, for his children’s education; I was wonder when he said his elder son was Studying in St.Jonse school (one of the biggest school in chennai), and his wife was working domestic works in the near houses. On the day when we return to chennai, he was very happy, because to see his children’s and said he is going to have dinner with their family after 5days. I also brought his cell no and talked to him last week, and he was happy to receive my call, and told me that he was telling about me to his children’s and they like to see me. Hope to see them. 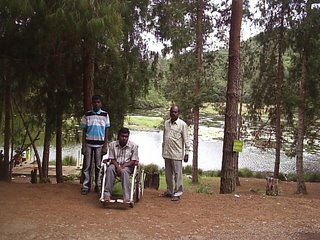 My Uncle was helped to take me to new places, which I haven’t seen; they came to kodaikanal mainly to give me company (to share with me). Before we visit the places, he will first check if can I go there or not. My happy lies on everyone’s hard work and I should thank them who was helping me, and hide there stress to avoid the sadness on my face. She went where only one man had ever been before and he was Russian too! 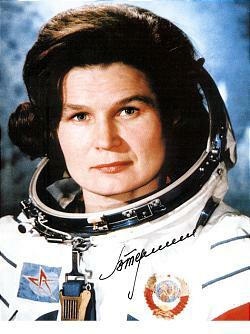 Valentina Tereshkova became the first women to go into space on June 16th in1963 (today). She blasted off in a Vostok 6 spacecraft and made 48 orbit of Earth, spending three days in space. Valentina was trained in parachute jumping and this was the main reason she was chosen form among more than 400 applicants for the mission. After her return form space, she married another cosmonaut. Andrian Nikolayev. Their daughter Elena interested scientists as the first child born to parents who were both space travelers. It was only 19 year later in 1982 that a second woman was sent into space. She was another Russian. Svetiana Savytskaya. Our travel towards Theakkadi was awesome. 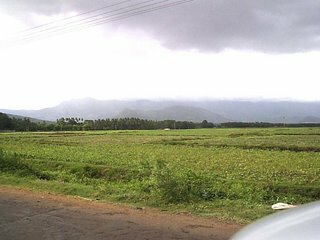 Two side of sky touching mountains with clouds spreading on it (they are west continue hills) and green fields was really cool for my eyes. 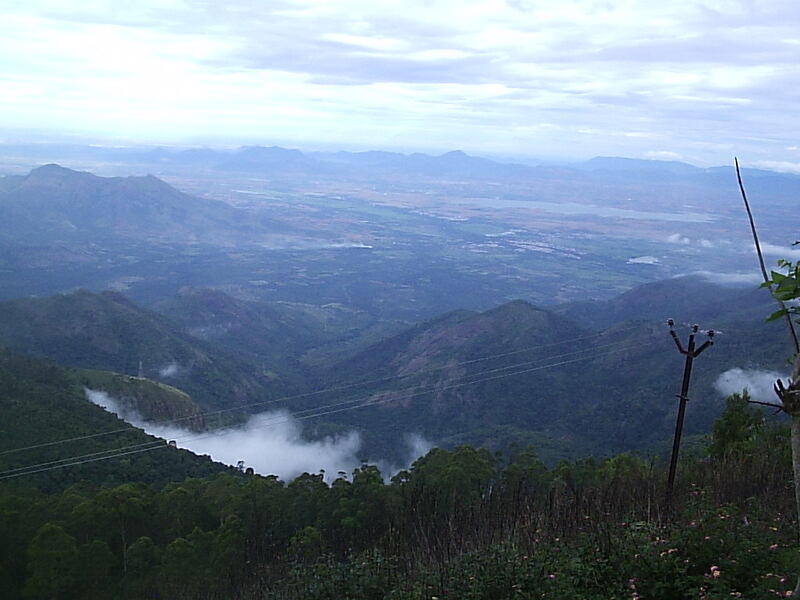 I was telling to my dad, if we live, we should live here (in the surrounding of Theni or Kambam (Theni is a district in Tamil Nadu). I don’t know how to explain what I feel, it was a dream come true to travel on these place, where I saw in movies and craved. I have crossed the bored and went to Andhra Pradesh, Karnataka, but first time I went inside the Kerala, I was sad when we were coming down form the hill, but when they said the Theakkadi was in the top of hill, the happiness come again. The Theakkadi was a big lake, which leads to Peariyar Dam. It was 4.00pm when we reach Theakkdi, the climate was very cool, we are the last passengers to buy ticket, if we come 5 minutes late we have missed the boat. It was a doubly deck boat, I went near the water in the wheel chare and shifted to chare. My uncle, brother and our car driver carry me inside the Boat. 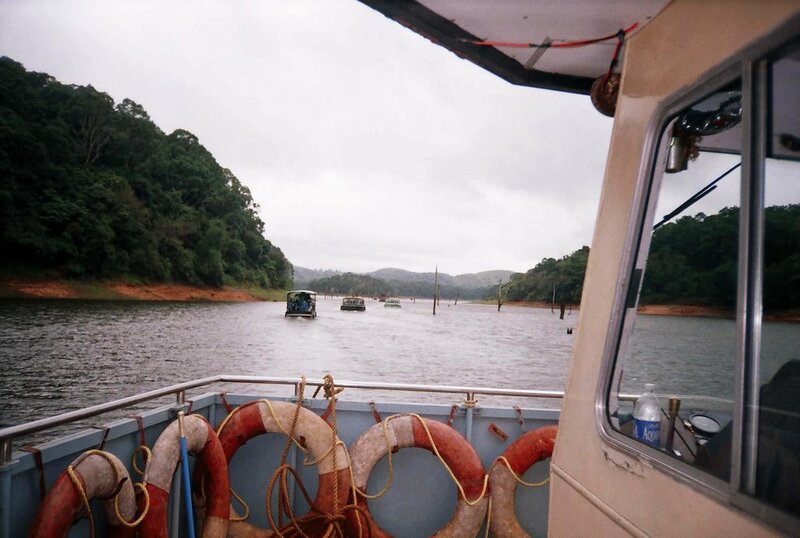 The boat ride was continued for an hour, the boat went slowly, so ever one can watch the animal on the shore. I expect to see Elephants and tigers, but saw only dears, one Forest Bull, and a crocodile lying on the shore. 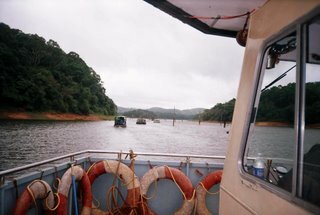 The travel on the Boat was unforgettable; the broken tress in the middle of water, the boat, and the lake, which was surrounded by beautiful mountains, chili drizzle ect…. We expect that the boat will go near the Dam, but they have turned. We were searching for animal in the Binocular, suddenly every one was shouting elephant elephant, when we go near only realized they are forest officer wearing black raincoat, it was a big joke. After finishing the boat ride and arrived Kumli (town near Thekkadi) the heavy rain started, my mom went to buy pepper in the near shops, the pepper will be very pure in this place and we had a tasty coffee there in the rain, drinking some think hot in the rain is Wow! After we come down form the hill, we met our relative who was a break inspected in the boarder of the Kerala, he booked a room for us in Kambam (one of the boarder town in Tamil nadu) and we stayed there. Next day we come to know after we come down form the hills there was heavy wind and trees broke down and blocked the traffic, good time we retuned soon, or else we have been caught in the middle of the forest. 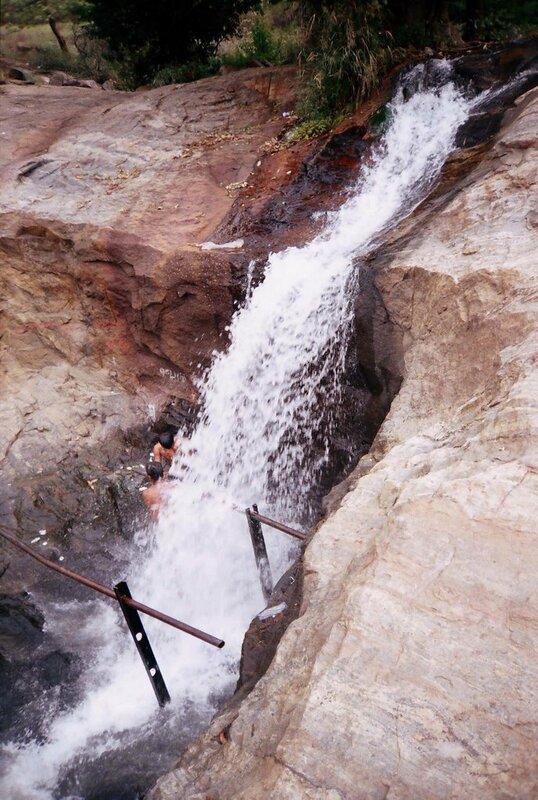 On Tuesday 30 on our way to chennai, we went to Kumbakkarai Water Falls in Peariyakum, the water come to this falls is form Kodaikanal, the water has medical conduct, my cousins enjoyed taking bath in the falls. This was the last place we visit and our vehicle headed to Chennai while returning our driver drew the car very fast and arrived our home at 9.30pm. Confusion on the title… Razick is my long yahoo chat Friend, who I meet today. He is a very cool guy, that why I wrote cool razick. I catch him in chat some months (10 months) back, in our first chat itself we become good friend. 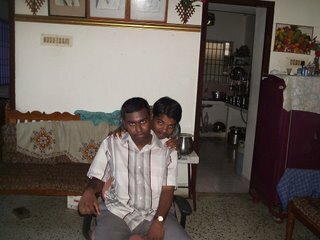 He was from Thirunelveli district (Sivelapari), studying B.com 3rd year, we have talked many times through Phone and dint saw each other, it was really a surprise meet. First he come to my house and asked where is phone booth, to call me, to find, in which block I am living, after some time he calls me and said I am in your flat and asked the door number. Very funny, we laughed each other when he enters our house. He notes my old house address form the greetings of New Year, and went there and found the new address and came. I dint feel like meeting for the first time, its like our friendship was continuing for long years. After talking for some time, I feel that his thoughts and my thoughts are same with little change. He was very proud about his family esp. her mom, he never hide any thing form her mom, I like this. He has an aim that he should not give trouble for his parents and wants to finish his studies soon and stand on his own leg (a job) to control his family stress. His father was working in Dubai and his bro is doing ITI and sis is learning some computer course, in his dad’s low salary they have to study and to control the family. He was also doing part time job, months back for his expenditure, to avoid the family money problem. He like to visit many countries, on his own money, he has hopes to become a big level in his life and expecting to achieve some thing He don’t know anything about Computer, just know to chat. So we saw some programs in computer and after seeing my blog, he likes to start a blog and I helped him how to post and edit the settings (click his blog Raz World). He was a good writer too, wrote 2 novels and some Tamil poems (like songs), he brought it for me, its very beautiful, hope he will write his novels and songs soon in his blog. I wish, like his good mind, his life should also be bright. He was calling my dad appa and mother as amma, what a nice friend I got!!! 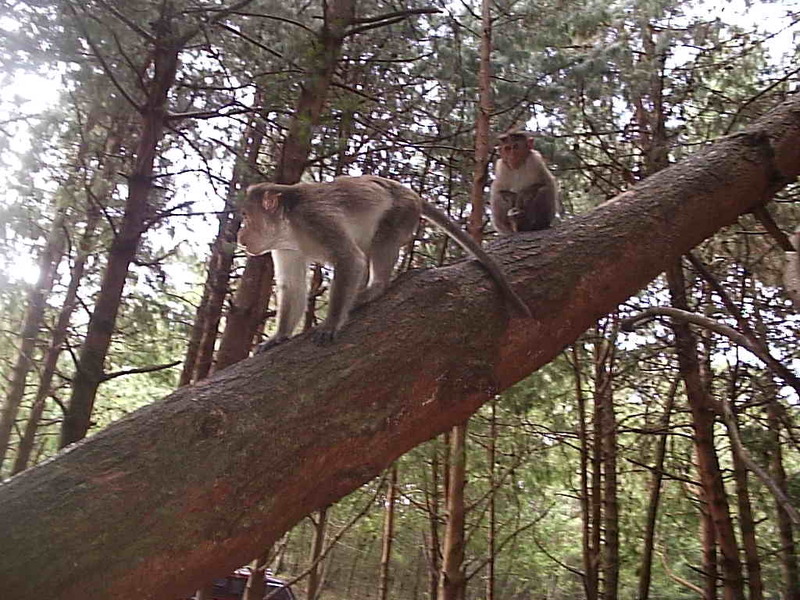 On Sunday 28th went to Barijam, it was a restricted area, a thick Forest. 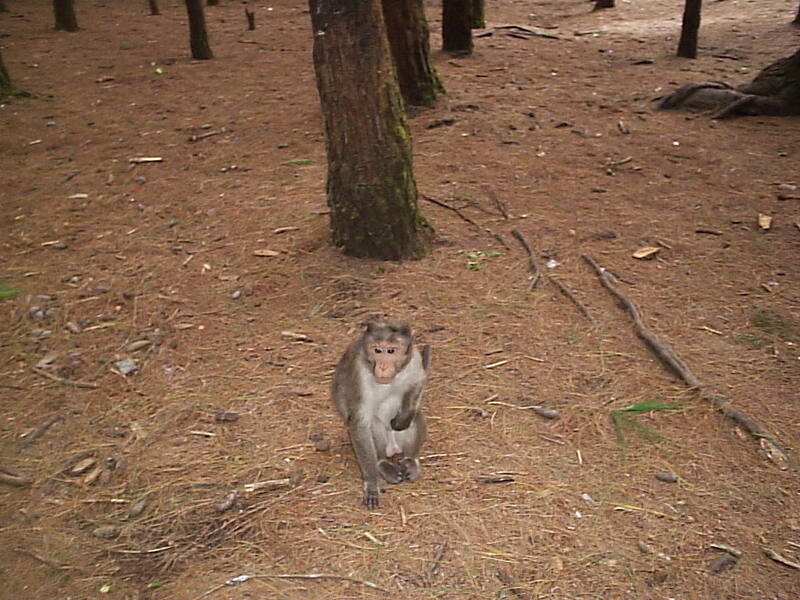 We brought permission form the Forest department and went, it was a unpolluted place. 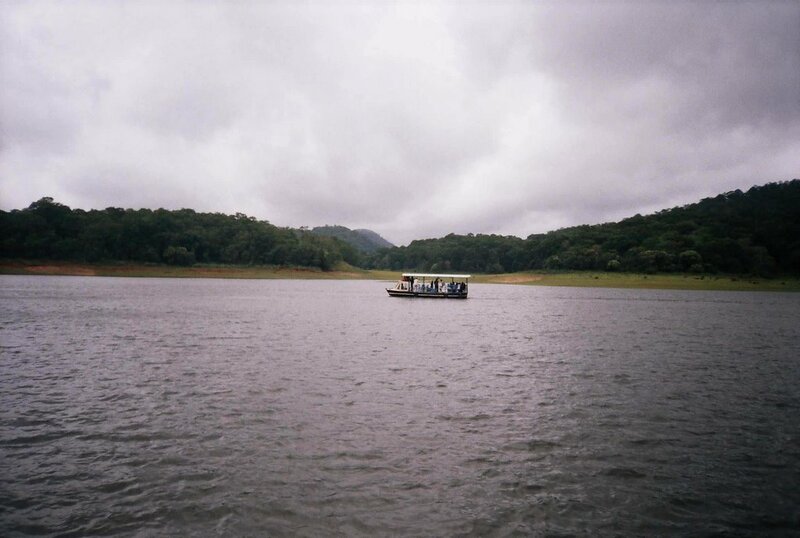 There was a beautiful fresh lake, in evening and morning forest animals will come and drink water, but the time we went, their was no animals, the lake was look like, the lake which comes in Hollywood movie Lake palace. We planed to spend at least 2 hours their, but the rain come and spoiled. The way to Barijam was cool, two sides trees cover the road, it was like going inside a cave, in some places the mist cover the roads and vehicle use lights. 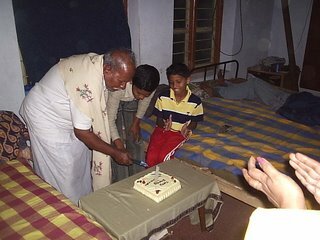 After return from Barijam we cut cake and celebrate our cousin Aravinds birthday in our room, he was happy to celebrate his birthday in Kodaikanal. 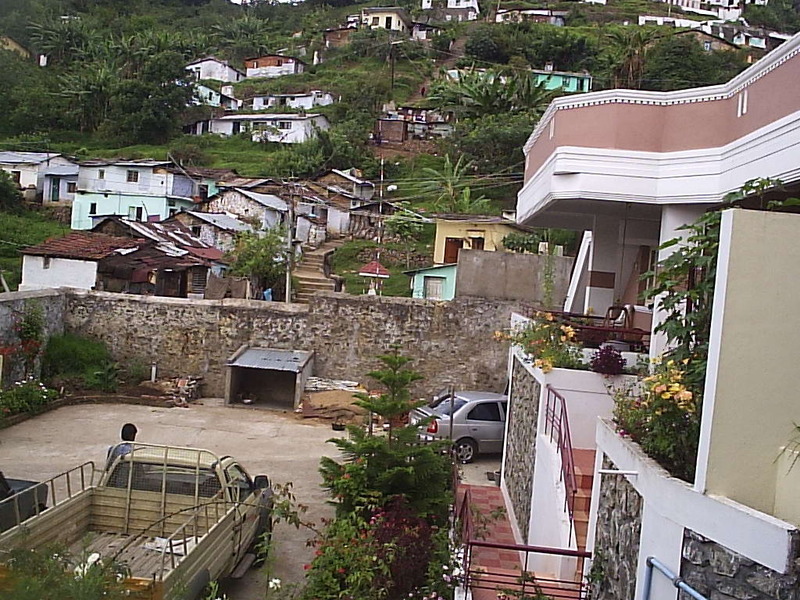 The place we were stayed was very down, the vehicle was very hard to climb, and easy to go down. The neighbor house was a beautiful bungalow, with lots of flowers and plum trees, our cousin go and secretly pick the plums and eat. 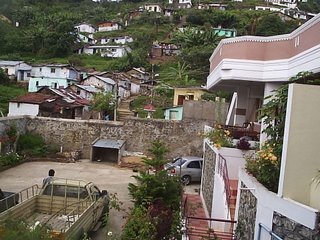 There are lots of houses built on the hill’s slope near to our house, it has long steps to climb, we can’t imagine if a mudslide comes, what will they do. They are living in risk; I was wonder to see these. 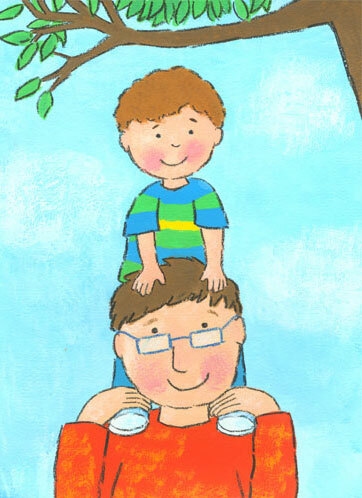 I saw in the binocular, there were 3 small boys playing cards in sitting on the slopes. Some kids play cricket on the in that place, I think what will they do if they shot a sixes, but were ever ball goes that pick them in minutes. This house is next to our room where we stayed, and the houses, which are, build on the slopes. 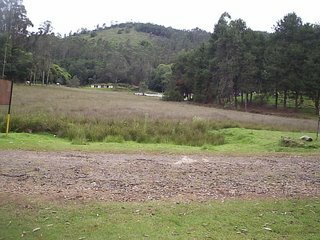 Actually our plan was to stay 3 days in Kodaikanal, but my grandma and grandpa can’t bear (stand) the cold, so we change our plan and decided to visit Theakkadi on Monday. 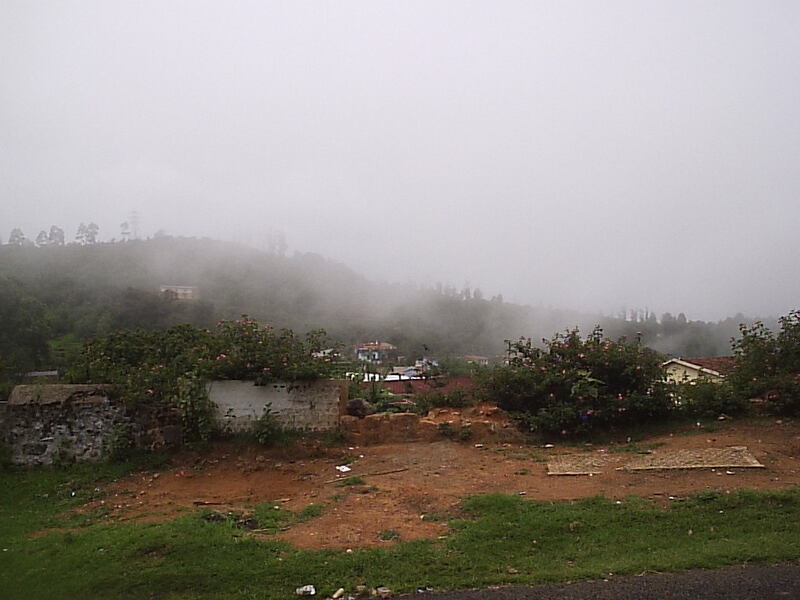 My mind is not read to leave the drizzle and cool Kodai; I am in a sad mood in morning, and tried enjoying the last movement on the hills and the chill. President A.P.J. Abdul Kalam the Hero of our nation (India). The person who work hard to fulfill his dreams and encourage every one to dream to achieve their goal. Recently Kalam dreams are coming true. When he visits Cheiachin last year, he becomes the first president in the world to visit the World’s Highest War place (Cheiachin). On February 13 this year he make a history by traveling in a most advanced Indian Navy Submarine, (the submarine which equipped with ballistic missiles that can be launched form under water) which went 40 meters below the sea. He was the first president to travel in a Submarine. 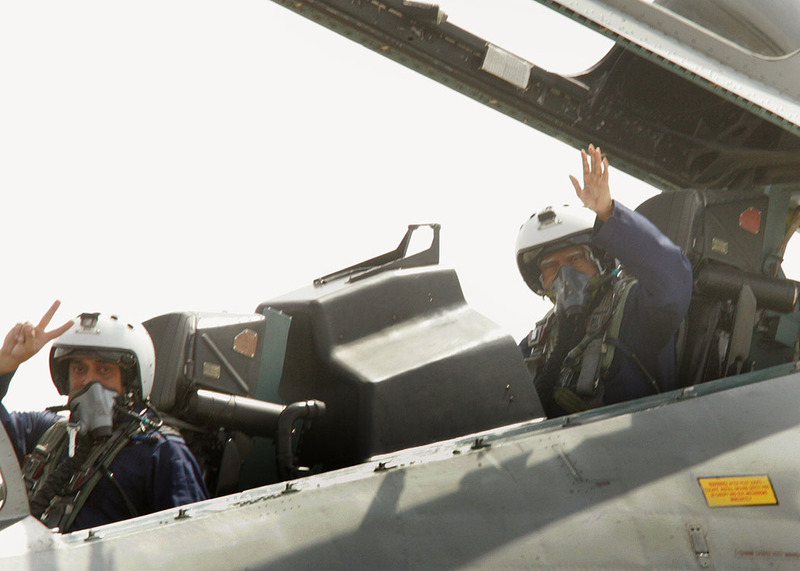 His another dream has come true yesterday by flying in Sukhoi – 30 Fighter Plane. In his 74th age he has make history by flying in a Fighter Plane, which can go faster than the sound. Kalam was the first President to fly in a Fighter Plane. 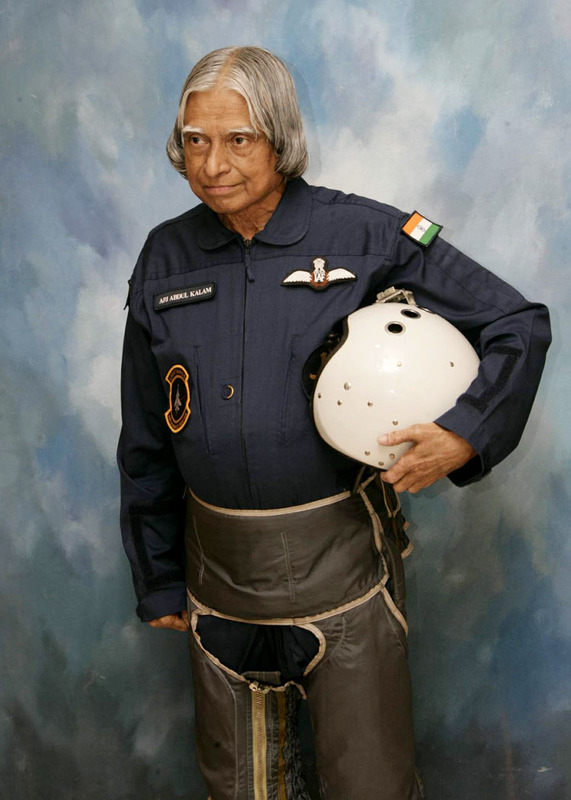 The jet went to a height of 25,000 feet, above 7 km and kalam was also allowed to turn the Plane to the left and then to the right when he had the controls, the flying continue for 30 minutes. It was Kalam’s dream since 1958, when he became an engineer, to fly in a fighter aircraft. History continues in the Parliament Ammendment Bill (Prevention of Disqualification), which exempted the post held by some MP’s including congress president, Sonia Gandhi and Speaker Somnath Chatterjee. This controversy happened when Kalam referred the complaint against the MP and actress-turned-politician Jaya Bachchan to the election commission for holding two posts. The President's secretariat checked if there had been an effort by the government to consult all stakeholders before bringing the amendment to the bill. He concluded that the application of the law with a retrospective clause would save a few individuals from disqualification, but it stank to high heaven. Kalam felt there was no public good in giving this retrospective exemption. Kalam felt there was misuse of the exemption. 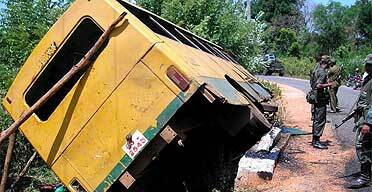 Ten days after receiving the legislative proposal, Kalam read the voluminous file once again. He also read the secret files in the Rashtrapati Bhavan, on the bills rejected by his predecessors. He was convinced that the bill would be against the spirit of the Constitution, so he sent it back unsigned. This is the first time in the History a President sent the Bill with our signing. The next one was Pillar Rock; there are three Natural rocks, which look like Pillars. But we cant se that fully, because of Mist. The views form Coakers Walk was very beautiful, the small villages in the down and the houses on the slopes are wonderful, first 5 minutes we cant see any thing, the place was fully covered my mist, which look like white screen. 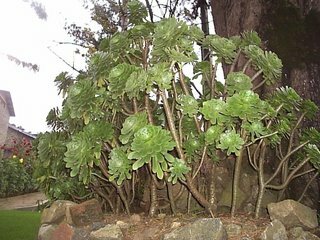 Which are all I missed in my last trip, and it was fulfilled now. 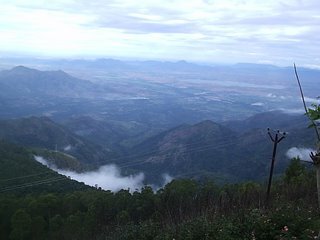 In Evening went to the Famous Kurunji Andavar Temple, one of the height place in Kodaikanal, a silent temple with cool breeze. 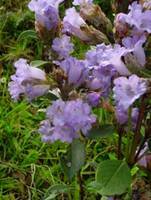 In Tamil literature Kurinji means hill region and Andavar means God. Hence Lord Muruga is referred as God of hill. Wherever we go, we will be reaching our room before 7.pm, the cold wind was very high. Form our room we can see the lights of vehicles, which are going in Pariyakum (a small town in the foot of kodaikanal hill), first we thought these are lights of vehicles which passes in the hills, next morning only we know that there is no hill before us only valley. You can see the clouds(mist) which cover like a white screen in our background(in Coakers walk). 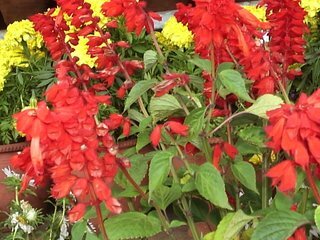 When I was there at last time the cool was low, but this time the rainy season has started earlier in Kerala, so the climate was very very cool, even the floor was very chill, everyone wearing slipper inside the house, only in the bedroom they put floor mats. 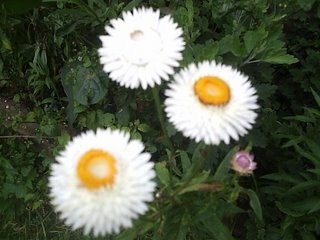 The early morning was lovely, some times the mist cover our place, the blooming flowers are very beautiful. The snow drizzle are… awesome. 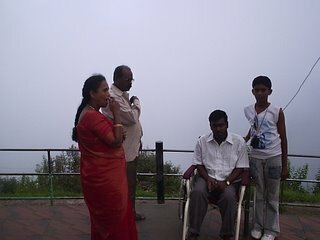 In morning on 27th my aunty family also joined with us. 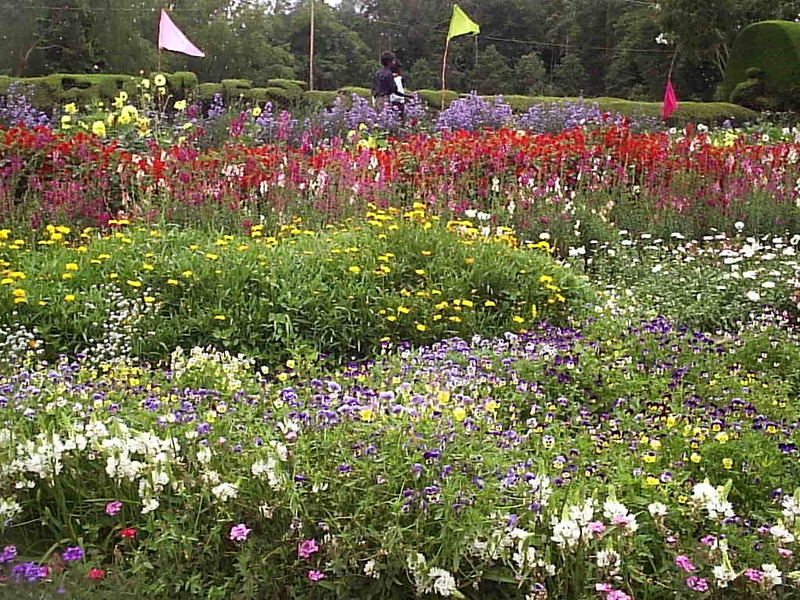 First we went to Flower Show in Bryant Park, we had to see Different different Roses and many beautiful flowers, we expect to see more Kurinji Flowers (Kurinji is a flower which bloom once in 12 years. 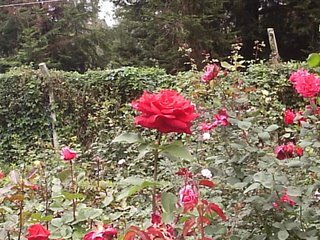 It last flowered in 1994.) 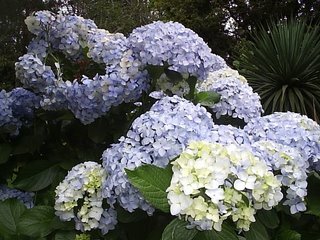 but we saw it only in garden very little. 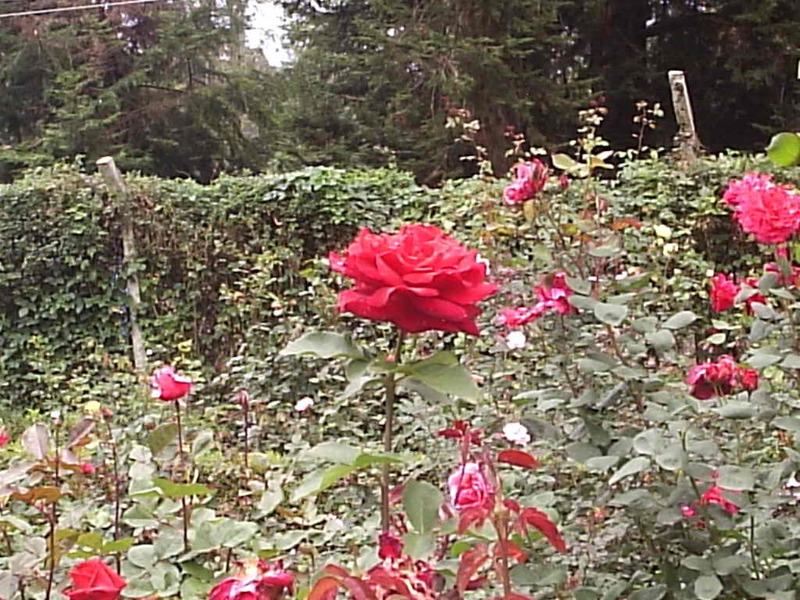 The green grass are not good, full of garbage, and mud, I confuse is that garden or roadside. 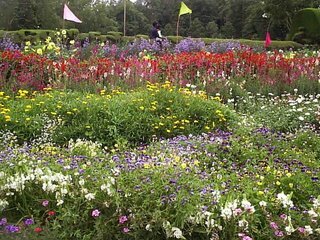 Good time for me they have build ramps in gardens, so I can go everywhere in my Wheel Chare. I round the Lake in my chare, they have organized boat race and duck catch contest. The main problem in Kodaikanal is Traffic, wherever we go there will be a row of vehicles standing before us. I like the traffic jam there, so I can see the sight scenes slowly. 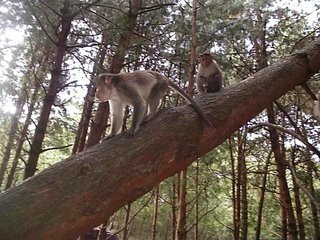 We had our lunch in a Savukku (tall trees) grove, a very cool place, their are lot’s of Monkey with there kids seeing us, jumping here. They come with their groups and eat the food, which we feed them. Wherever we go the mist cover us, it was a new experience for me, I think the people living there are luck. My Kodai Kondattam (enjoy) started on 26th Friday 6.pm. 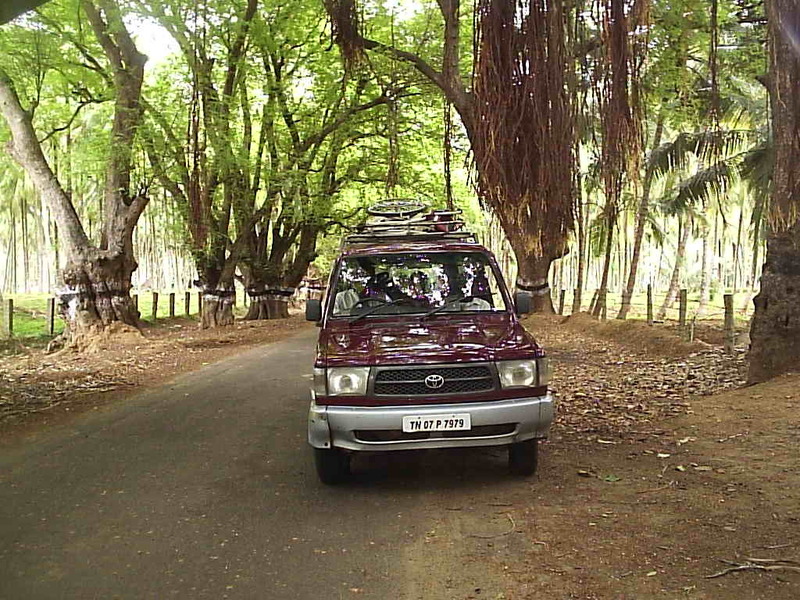 We took a Toyota Quails for out travel; luckily I sit in the front seat for sight scenes. 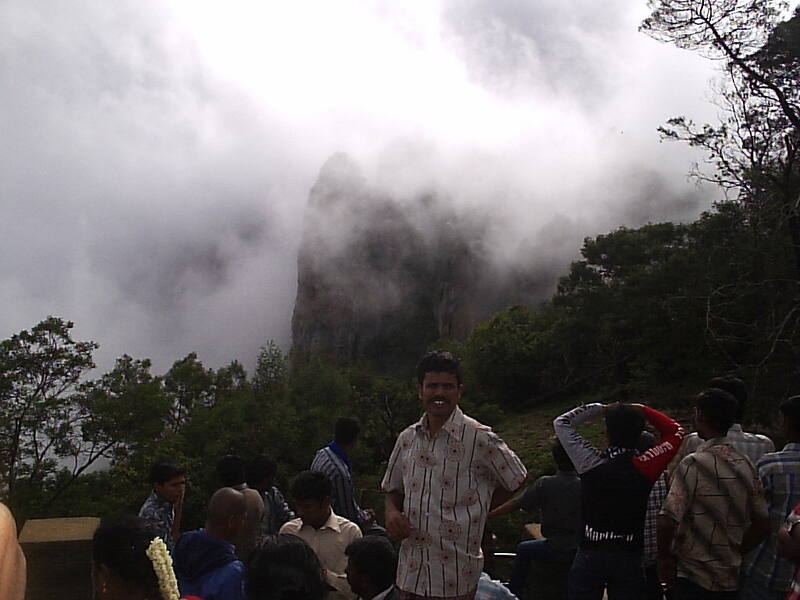 It takes at least 12 to 13 hours to reach Kodaikanal. This was the long distance I traveled in last seven years. 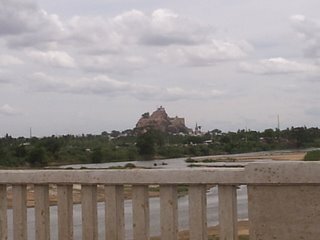 The highway road was very nice up to Dhindivanam, after that the road was shorter as 2-way lane. I really feel that traveling in highways is risk. The Driver Raja was driving well without any sudden break or Sound Horne (only in some unavoidable turns). The climate was very cool when we start our travel. 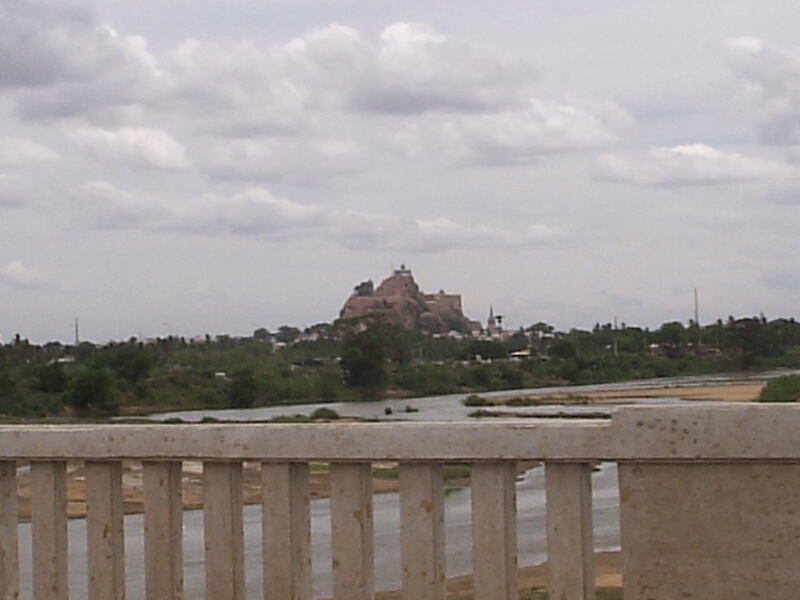 The sight scenes are very beautiful, the Cauvery River, the small villages, fields, hills ect.. The road form Dindigul to Kodai road was beautiful with 2 sides’ hills, coconut grove, banana grove and sunflower fields. 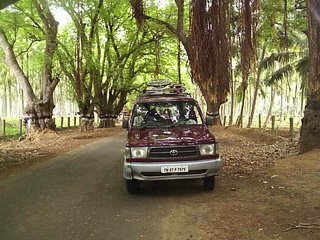 When we cross the Thiruchi 3 Quails was overtake us, in that the Pondicherry Chief Minister R.Rangasamy was traveling, we can’t hope that a chief minister was traveling before us. He was very simple; with only 2 police vehicles are following him. We were following him, they also traveling in Quails, they were very fast, our driver was chasing them, it was very easy to for us, the opposite vehicles leave way for us, every one thought our vehicle was also Chief Minister. It was very funny, people on the road are seeing our vehicle and taking some thing, my cousin brother was showing hands for them. I think he was going for Palani Murugar temple, so he went on another way. We thanked him, to, clear our way and help the travel easy.